Createspace Independent Publishing Platform, 9781503037069, 104pp. What do you get when you mix a bundle of coloured yarns with a few crochet hooks and a smattering of imagination? A collection of the cutest of cute Amigurumi Animals Amigurumi literally means crocheted stuffed doll or toy and contained within this book are patterns for 21 amigurumi animals of all shapes, sizes and personalities. It doesn't matter whether you are a beginner to crochet or a more experienced crafter, this book will get you hooked from the start Amigurumi Animals is packed full of easy to understand and unique crochet patterns that produce adorable little creatures, loved by all ages. There are Minibeasts such as Spot the ladybird and Lizzie the bumble bee, teddy bears both large and small, and Water Babies including Dr Octavius the octopus and Chip the goldfish. There are also some Marvellous Mammals such as Moochi the kitten and Vanilla the bunny as well as a final section on Monsters and Make Believe including Herbie the cute dinosaur and Rudolf the red nosed reindeer. This book includes step-by-step pattern instructions for each animal, beautiful colour photos throughout, handy tips on basic crochet stitches and construction, advice on hooks and yarn and detailed know-how on working in the round and creating spheres. Amigurumi Animals is an inspiring and fun crochet book, essential for any crochet enthusiast What are you waiting for? Let's get crocheting. Susan Yeates is an established designer, author and crochet enthusiast. She formed her company Magenta Sky in 2003 to provide accessible art and craft tuition to artists of all levels. This includes regular craft courses, books, patterns and other free resources. Susan's art and craft books include Learning Linocut published in 2011 and Make Your Own Christmas Tree Decorations published in 2014. 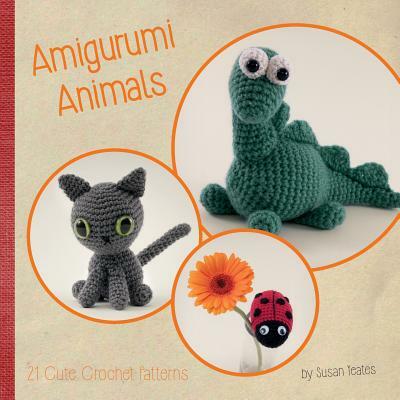 Amigurumi Animals is her third publiation and the first (of many!) to focus entirely on crochet.